Duke Arts / LINK Mediawall in conjunction with CHAT 2010 Digital Arts Festival. Bill Seaman, artist (concept and initial design) with Todd Berreth, programmer and designer (creative coding, additional design and engineering). Worked on in Bill Seaman’s studio @ Duke University and the Duke Pratt School of Engineering’s Visualization Technology Group. 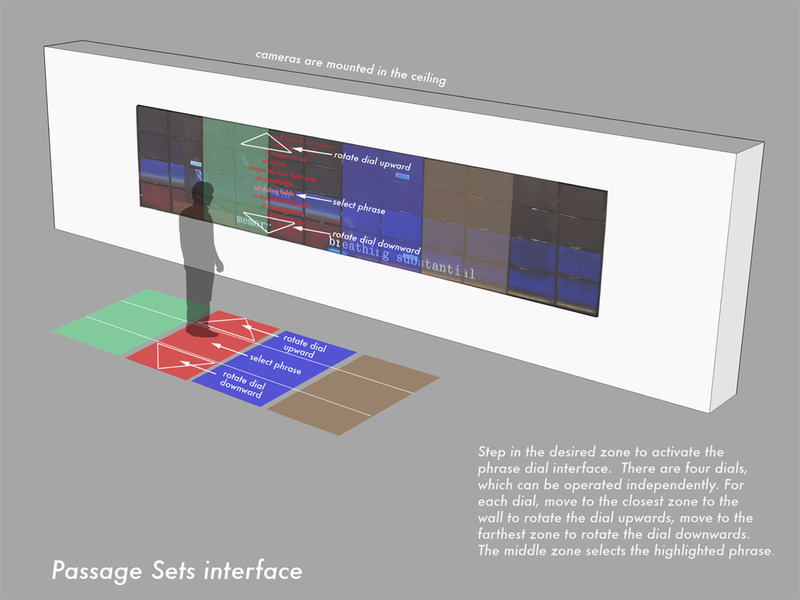 interactive installation, custom software written in C++ and OpenGL, using CGLX to allow OpenGL distribution across an eighty megapixel tiled-display context. The viewer’s body position is detected by an array of cameras mounted above the displays. The field is stitched and processed via custom camera software, also written in C++ and heavily dependent on the OpenCV and OSCPack libraries. Passage Sets / One Pulls Pivots at the Tip of the Tongue is a generative visual poem by Bill Seaman. It includes an interactive poem generator. The users of the system can position themselves in front of the screen and select words and/or phrases from four lists that become visual as they enter into differing proximities in relation to the screens. Moving forward and/or backward, then stopping in the center of the field, enables the participants to make selections from specific lists authored by Bill Seaman. These words then flow across the screen and become part of an ever-changing line of text at the bottom of the screen. The poetic text is juxtaposed with video and still image material, primarily architectural imagery, shot by Seaman in and around Tokyo, Japan, and Karlsruhe, Germany, which contrasts the past and the present, and focuses on travel, motion and light. Bill Seaman premiered the original version of Passage Sets / One Pulls Pivots at The Tip Of The Tongue in 1995. That version has been shown internationally and is in the permanent collection of the ZKM Museum (Center for Art and Media), Karlsruhe, Germany. This installation opened in conjunction with the CHAT 2010 Digital Arts Festival.